Draco as depicted by Johann Bayer in his Uranometria (1624). 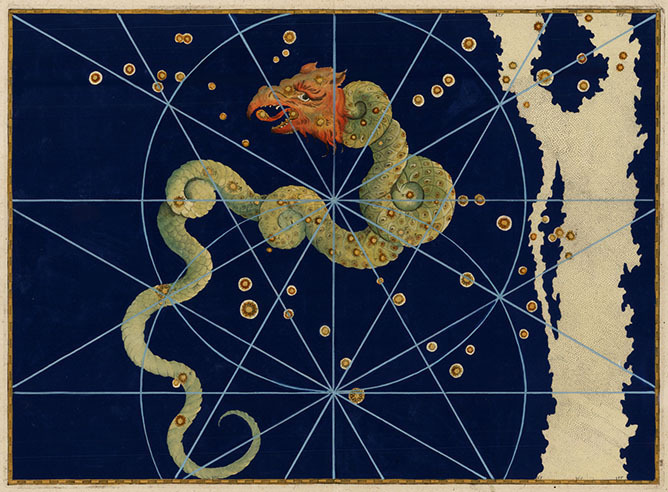 Source image provided by www.RareMaps.com — Barry Lawrence Ruderman Antique Maps Inc.
Draco, “The Dragon” has been said to represent a number of scaly beasts. Most frequently he is considered to be Ladon, the dragon that guarded the tree that was the goal of Hercules’ eleventh labor. This tree produced golden apples and had been given to Hera as a wedding gift. Hercules’ labor was to bring some of the fruit back to King Eurystheus. In one version of the story Hercules uses one of his poison arrows to defeat the dragon. These are the stars in Draco with a minimum magnitude of 3.0.